The recipe for this traditional wheat bread from England comes from Dan Lepard’s book “The Handmade Loaf”, that I mentioned before. I’ve made quite a few breads from it, and at first this one seemed a little too involved, because it required not only a levain (sourdough starter), but also a barm . But, I was inspired to try it after reading a wonderful post about it. Heat the beer to 160F, remove from the heat and quickly add the flour. Transfer to a bowl and allow it to cool to 68F, then add your white levain. Leave it at room temperature overnight or until it is very bubbly (my barm fermented for 30 hours). Waiting for it to cool to 68F…. 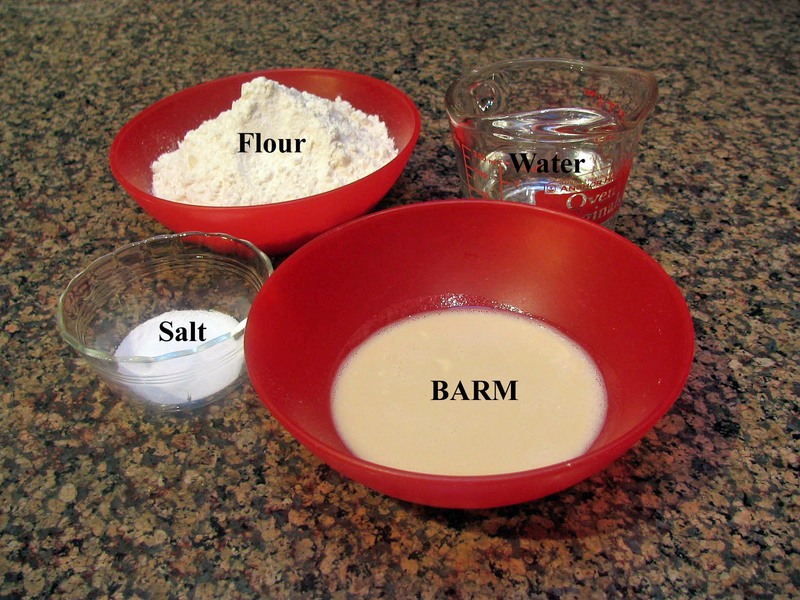 Mix the barm in a large bowl with the water to completely dissolve it, then add the flour and salt. Mix it all with your hands; it will be pretty shaggy and you will doubt that it will ever become smooth…. don’t worry, just let the dough sit there for 10 minutes, covered. 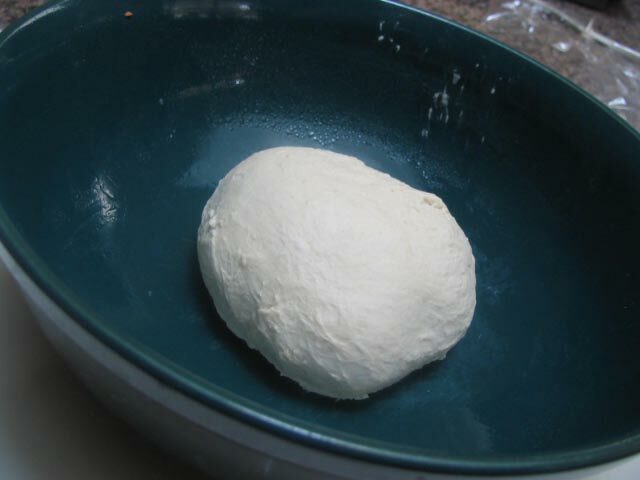 After 5 hours, knead it briefly again, allow the dough to relax for 10-20 minutes, and shape it into a “boule” (see one method here). Gently transfer it to your vessel of choice for the final rise (about 4 hours) before baking. I used a banetton lined with a fine cloth, sprinkled with cornmeal. 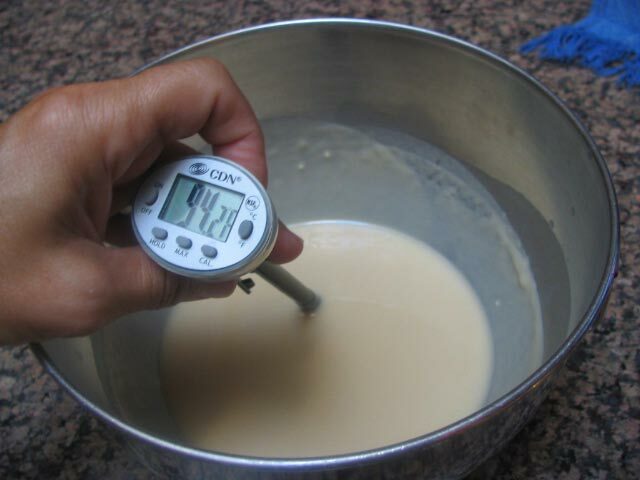 The bread will rise to 1.5X its initial volume; when you press it gently with a finger, it should feel airy and light. I baked mine in a clay pot at 430F for 30 minutes covered, and for 15 additional minutes with the lid off. 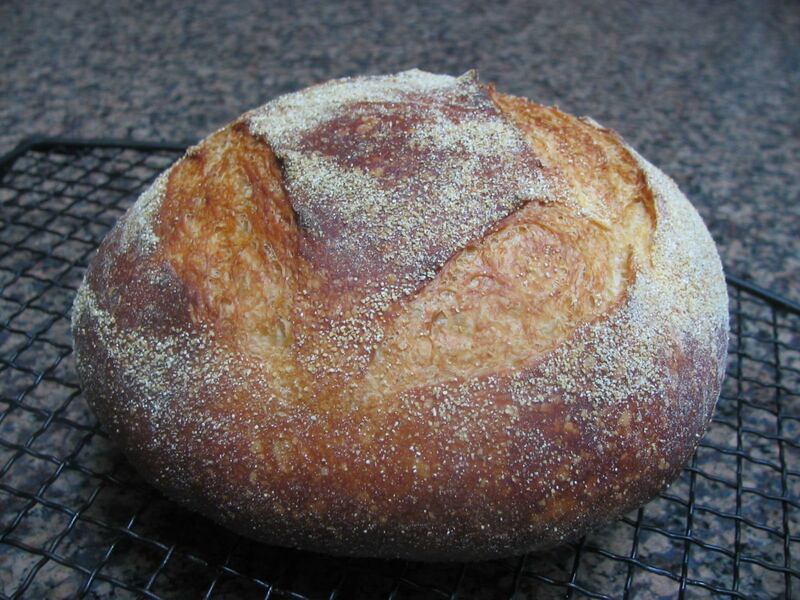 This bread is a winner in every way: flavor, crust and crumb texture, and looks. The beer gives it a subtle sourness completely different from a regular sourdough, made with levain only. It is a perfect match for a ham sandwich, or to go along a hearty soup or salad. I kept thinking about split pea soup while munching on the bread. I’ll definitely make it again, with different beers and flour mixtures, as advised in Lepard’s book. General comments: please, don’t be put off by the time it takes to make this bread. Even though it’s about 10 hours from beginning to end, it’s essentially a hands-free time. Also, you can start the bread in the afternoon and let it rise in the fridge overnight. Next morning bring the bread to room temperature, let it rise for a couple of hours and bake it. Some bakers say that you can put the bread straight from the fridge into the oven, but I prefer to slowly warm it up. 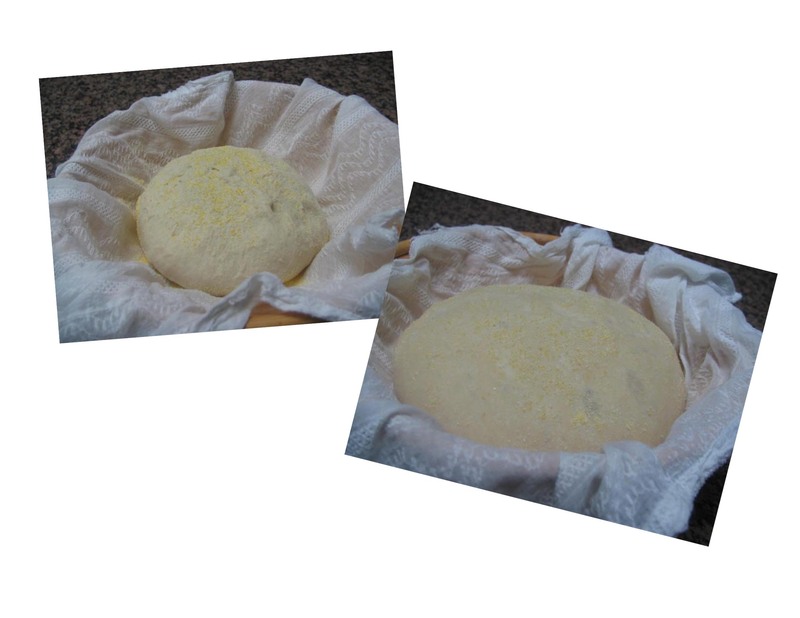 Around the 2 hour mark, the dough will show a definite change in texture,and you can tell the gluten is developing. After 3 hours air bubbles will appear, and soon you’ll learn how to treat them right: no excessive force, no excessive gentleness. 😉 The way you handle the dough in its final shaping will deeply affect the crumb texture. Don’t crush the air bubbles, but also don’t leave a huge air pocket in the middle of your bread! With bread baking, practice is everything. 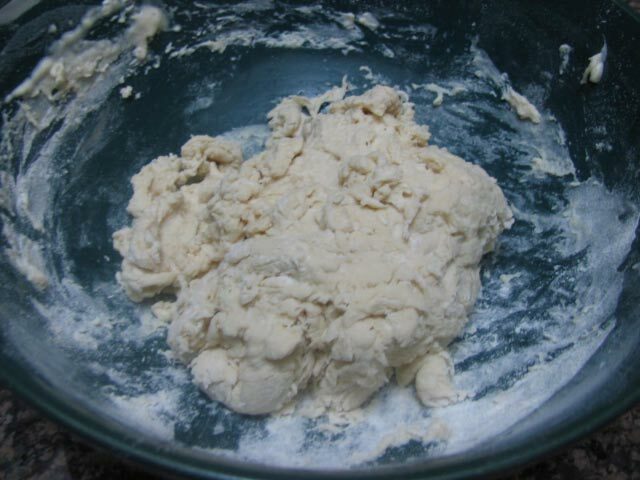 Pick a recipe and make it over and over and over… remember, it’s only flour, water, a tiny bit of yeast and salt! Important note to self: not a good idea to turn the beer bottle up and down a few times to distribute the yeast inside before opening it. Don’t know what I was thinking, but a lot of beer and time was lost in the process of cleaning the mess. I would say that bread is a winner. Looks great. 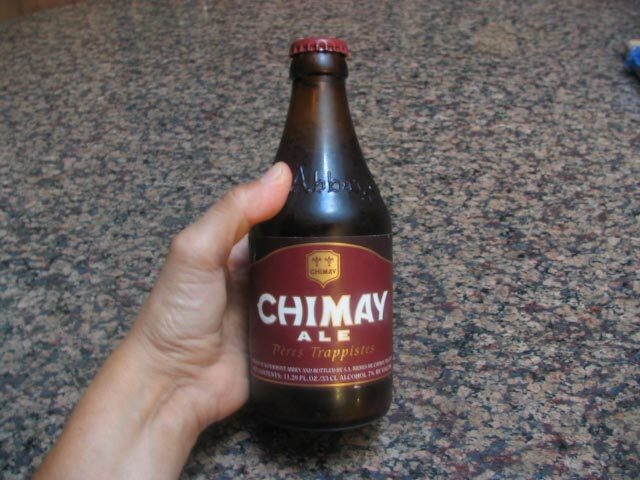 If Chimay is hard to find or seems too expensive, any of the Bell’s ales are bottle conditioned (live yeasts). can you get barm from a brewery and then use it straight up for making the bread dough? I’m going to try to make this barm soon for a historic recipe for barm dumplings. Thanks for the information. I’ll link my blog post back to yours for the instructions. Awesome! thank you, and good luck with it! They still sell barm cakes here in the North West of England, lovely with chips on, and lashings of salt and vinegar. Oh, how lovely!!!!! You made me feel I am right there!